Tips For Getting Your PA Real ID On The First Try? Having just completed the PA Real ID process successfully, I thought I’d post a few tips and tricks to help you successfully navigate the system and get your Real ID on the first try. If you’ve been following along with the story of Real ID, then you’ll know that a law enacted in May 2005 by congress (The Real ID Act of 2005, Pub.L. 109–13, 119 Stat. 302) requires states to update the process by which you can obtain official (or Real) ID. Why am I just hearing about this now in Pennsylvania? 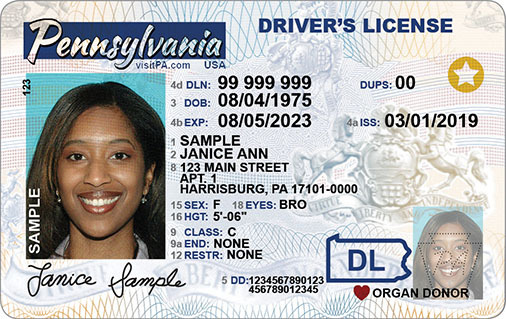 Jump ahead 14-Years and the state of Pennsylvania (after several deferments) is finally working to be compliant with Real ID requirements. Beginning in March 2019, you can now do more than just pre-qualify for Real ID, you can actually get your Real ID….but not so fast. Beginning in Oct 2020, you will no longer be able to board an airplane for domestic flights or enter a federal facility that requires ID using your Pennsylvania Drivers License UNLESS you instead use a current Passport OR you get your Pennsylvania Real ID. Why Not Just Get a Passport or Passport Card? A valid US Passport will allow you to board domestic or international flights and enter federal facilities that require ID…however, the cost of a Passport is significantly higher and like me, most people don’t want to carry around the larger-sized passport. It won’t fit in my wallet and the expense and hassle of replacing a lost passport is significant. To get your first passport, you also have to get your certified birth certificate anyway, which I believe is the hardest part of getting Real ID for most. A Passport Card is an option for some, but keep in mind that you do have to send in your Passport to get a Passport Card. They will return it, but I simply wasn’t up for shipping my Passport around so much to try that option. I believe the cost is $25. Why Should I get Real ID Now? Prior to March 2019, the Pennsylvania Department of Transportation (PenDOT) was allowing you to pre-qualify for Real ID, so that in March 2019 you would be able to apply on-line for your Real ID. Beginning March 1st 2019, you can actually go to an approved PenDOT DMV (they’re not all approved) and get your Real ID…and believe it or not, it will take the state quite a while to get everyone converted to Real ID. With an Oct 1st 2020 deadline and the time it may take you to get the necessary documentation together, the time is now to begin the process. For now it will be a choice you will have to make based on your situation. If you don’t fly domestically or if you’re OK just using your Passport for ID, then for now maybe you don’t need Real ID. A good breakdown of PA Standard ID/Drivers License versus Real ID is here….so decide what makes sense for you. There’s also a Is Real ID For Me process you can try to help decide. OK I’m In…How Do I Get Real ID? The whole point of Real ID is that it makes it much harder for someone to gain a fake ID and use that fake ID in a less-than-savory way. So naturally the process is going to require you to present a significant amount of documentation to prove you are who you say you are. The rules have been tweaked a few times since I started the process, so be sure to check on PA DMV site for the latest documentation rules. What Documents Do I Need And How To Get Them? Thankfully my circumstances were fairly straight forward, so I don’t plan to walk you through the process if you have a more complex situation for identity (name change…). Check the website for yourself, and don’t just rely on my experience and be grumbling at me while you wait at the DMV. Here’s what I encountered. Proof Of Identity- If you have a valid passport YOU ARE SET for proof of identity. Otherwise you’ll need a Birth Certificate with a Raised Seal, a valid passport card, a Certificate of U.S. Citizenship (USCIS Form N-560), Consular Report of Birth Abroad (DOS Form FS-240) or a Certificate of Naturalization (USCIS Form N-550 or N-570). If you are a non-US citizen check the site here. To get a certified copy of your Birth Certificate in PA you can go to this page. Keep in mind it will cost $20 AND this is likely the step that may take the most time (I’ve heard some people report months for this to arrive). Proof Of Social Security Number on a valid Social Security Card. This may be easy for you if you have your Social Security Card. In my case the familiar name (Bill) used on my 1960’s original social security card did NOT match my official name (William) on my passport or drivers license, so I had to get a new Social Security card. I accomplished this for free by visiting the Social Security Administration Building on Wilkes-Barre Blvd, in Wilkes-Barre, PA. The process took minutes (after waiting my turn for 30-mins on a Tuesday afternoon). I was required to show my current driver’s license and current social security card. The process was free and my new Social Security Card arrived in the mail 4-days later. ** Again the name on your Social Security Card, Driver’s License, and Passport (or Birth Certificate) must match exactly. If they don’t, correct this BEFORE you wait at the DMV, only to be rejected. There is some debate about full middle-name versus middle initial being (or not being) an exact match. I suspect that may be up to the DMV worker you encounter. My Auto Insurance card that I used only had middle initial. The other documents had full middle name. Proof Of PA Residency (TWO DOCUMENTS). If you have a valid PA current Drivers License and a valid PA vehicle registration or insurance card, YOU ARE SET. I used my Drivers License and Insurance card. You can also use a “Computer-generated” utility bill showing your exact name and address, a W-2 form, a tax form or even a lease/mortgage document. Just be sure the name and address matches the one on your other documents and you have TWO proof of residency documents! What Tips I Can I Add From My Experience? It sound silly, but make sure all of your documents are NOT EXPIRED. Yes I saw people at the DMV fail with an expired passport or driver’s license. Make sure you bring payment in the form of Credit Card, Check or Money Order. The DMV will NOT ACCEPT CASH. I visited the DMV at 3PM on a Wednesday in Hanover/Wilkes-Barre, PA-- (1085 Hanover St, Wilkes-Barre, PA 18706). be sure to check their hours before you go and allow sufficient time before closing time. Once inside the door go to the kiosk and click on the Real ID button. This will print a number on a ticket. Have a seat and wait for your number to be called to a specific station. The numbers have a preceding letter like A, B, C…). My number was I090 and the ticket told me there were 12 people ahead of me waiting to get Real ID. The room was FULL and the “I” numbers were moving slowly. To get through the 12 people in front of me took roughly 75-mins so pack your patience and don’t show up 30-mins before closing time. Once my number was called the woman filled out two forms that I had to sign/date, she scanned my Passport, my Social Security Card, My PA Drivers License, my forms and my Insurance Card after CAREFULLY checking that they are all current (not expired) and that they all match names and addresses. My charge was $60.50. My current license was set to expire in 2021 so the Real ID extends that to 2025 (thus the $60.50 license charge). I used a credit card to pay (they do not accept cash). At that point they printed my new Real ID (using my previous drivers license photo and signature), punched a hole in my old drivers license and returned my documents. That was it? Was Everyone Successful at the DMV? Yes I went out the door with my Real ID. It took me a few weeks to gather the proper documents and correct the one document I had to correct. I waited 30-mins at the Social Security Office and 75-mins at the DMV. I paid $60.50 for my Real ID and my Social Security Card updated was free. Trying to use a hospital birth certificate, a family bible birth record or an older state birth certificate without a raised seal. Bringing cash and not a check, money order or credit card (I’ll admit I didn’t hear the end of that transaction as my number was called). Only having one proof of residency instead of the required two. I sadly also overheard people stating they had already waited 3-hours at the DMV last week to be rejected, only to be rejected again. This included one person who didn’t bring back the documents on their 2nd trip that they presented that were valid when they failed for some other reason on the first trip. Prepare, prepare prepare! Make sure you have everything, the documents are valid/not expired, you have documents that match and that you bring a credit card for payment. In my case, I presented my valid US Passport, my new Social Security Card, my Current Drivers License and my current Auto insurance card and I Survived The Pennsylvania Real ID Process…and you can too (if you read the article above). Good luck and I’ll see you on the flight. PS Other than the gold star in the upper right corner, I don’t see any other differences in the license itself.